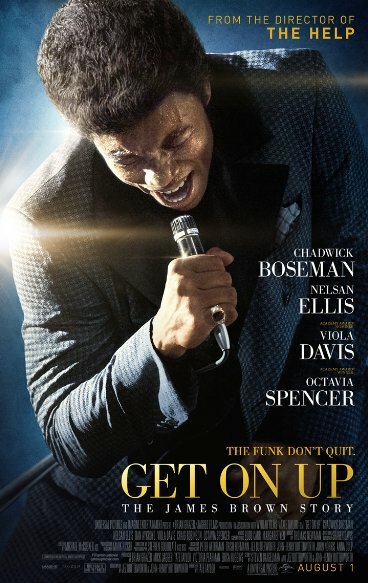 I’ve been looking forward to seeing Get on Up for quite some time now, as it’s the long-awaited biopic of the Godfather of soul himself, James Brown. Producer Brian Grazer has been trying to make a film about the soul legend for decades now, with the plans being in the early 90’s of Grazer producing a film with Eddie Murphy as Brown, which would be bizarre since Murphy had previously done the SNL sketch “James Brown’s Celebrity Hot Tub”. But we now cut to 2014, with the finished product quietly coming to theaters. It unfortunately opened on the same weekend of Marvel’s Guardians of the Galaxy, and the film has so far underperformed in its second week. We have Tate Taylor, director of 2011’s The Help, at the helm of the film, and Chadwick Boseman, who last played Jackie Robinson in last year’s 42, as the Godfather himself. Here’s my review of Get on Up. The film chronicles Brown from his days as a poor kid in the deep south of Georgia to his rise as being one of the biggest musical acts of the 20th century. You see Brown starting out in the deep south circuit, where he plays for largely black audiences, to playing shows at The Apollo and The Garden in Boston. You see Brown’s rise and fall in the world of music, and (nearly) all of it is chronicled in this 2 and a half hour film. The film was written by the Butterworth siblings, Jez and John-Henry, who recently wrote the screenplay to this summer’s brilliant Edge of Tomorrow. However, I’m pretty sure Christopher McQuarrie did a massive rework of their script, so there’s no telling how much of their script was in the finished product of one of the best films of the year. The film has a very interesting narrative for the first half or so of the film, as it cuts from James Brown’s career in the early to mid 60’s, to when Brown was growing up without a mother or a father around to care for him. In the latter, we see Viola Davis play Brown’s mother who leaves him when Brown is just a young child. We don’t see much of Davis in the film, but the few scenes that we do see of her, she does fine work as always. We also get some great supporting work from Dan Aykroyd, who plays Brown’s manager early on in his career, and Octavia Spencer, who won an Oscar for Taylor’s The Help, as a mother figure to a young James Brown early in the film. An up and coming actor named Nelsan Ellis plays Bobby Byrd, Brown’s close friend and bandmate for nearly all of Brown’s long and spanning career. But easily the best part of this film is Chadwick Boseman as James Brown. Boseman impressed many, myself included, in last year’s 42, but with his role as James Brown in Get on Up, Boseman proves that he has the potential to become of the next great male actors of his time. Boseman is uncanny here as Brown, as he nails nearly everything about the legendary singer. His voice, his dance moves, his swagger, and so on. This film does have its share of problems (more on that in a bit), but I think that the consensus on Boseman’s performance is unanimously positive. I hope that what Jamie Foxx’s career turned out to be after his Oscar-winning portrayal of Ray Charles in 2004’s Ray does the same for Chadwick Boseman after this film makes an impact with the right people. It’s a bit too early to start throwing around the Oscar talk, but as of right now, Chadwick Boseman deserves an Oscar nomination for this incredible performance, and if nobody can match his performance (it will be tough, as I hear incredible things about Steve Carell in Foxcatcher), Boseman should win the damn statue. I hope that Mr. Boseman is going places soon. While Boseman is incredible in the role, and a lot of the supporting cast is superb, the film itself is a mixed bag. There are a lot of things I liked about the film, performances aside. The film never feels boring or slow, as the camera work and editing make the film feel very fast and exciting. The sequences with Brown performing on stage is exhilarating and exciting, and it’s some of the best concert sequences that I’ve seen in a scripted film in quite some time. However, when the film is having a good time with a lot of these sequences, they start to breeze across a lot of key elements in Brown’s life. They don’t really touch on Brown’s drug use in the 1980’s, and they mention Brown’s IRS troubles, but that’s the only time you ever hear of it, is just a mention. I would have liked to see more of that gone into bigger detail, but instead we have a pretty standard biopic that feels a bit too nice at times, and never as gritty as it could be. Maybe that has to do with the PG-13 rating toward the film, but I felt that somebody else should have made this film. Tate Taylor is a fine director, and The Help is a good movie, but I think a director like Lee Daniels or somebody along those lines could have done something interesting with the film as a whole. But, for what it’s worth, I did enjoy Get on Up. If you have to see the film, it’s for Chadwick Boseman and Boseman alone. I’m serious in that Mr. Boseman should deserve some award consideration come January for his performance in the film. And if you need another reason to see the film, it would be to hear 2 and a half hours of Brown’s greatest hits, and since I’m a massive fan of Rhythm and Blues, I felt right at home. I know that I’m supposed to support the non-CG films over the CG films during the summer and all, but if you had to choose between this and something like Guardians of the Galaxy, by all means I would tell you to see Guardians. I would say that it’s the movie of the summer, and it kind of is, but we all know what the movie of the summer (and the year) is. August 10, 2014 in 2014 Film Reviews, Movie Reviews.